Not to go all Austen on you, but is a truth universally acknowledged that the margherita pizza is the yardstick by which one can judge the skill of a pizzaiolo. When I heard that new pizzeria Queen Margaret in Clifton Hill village was serving not one but THREE kinds of margherita pizza, I knew I'd have to visit with housemate J (who is both vegetarian and a margherita connoisseur). Queen Margaret is the new venture from Robert (Cavallini) Coco. 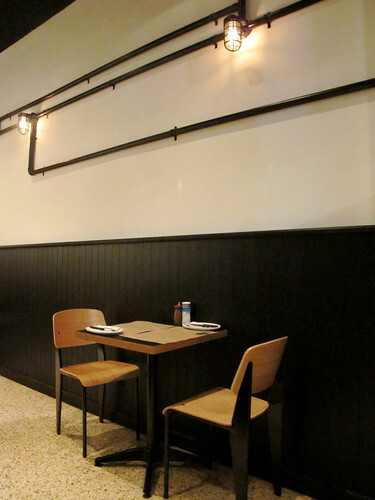 The restaurant fitout is stylish, with dark timber panels along one wall and exposed pipes and light bulbs. 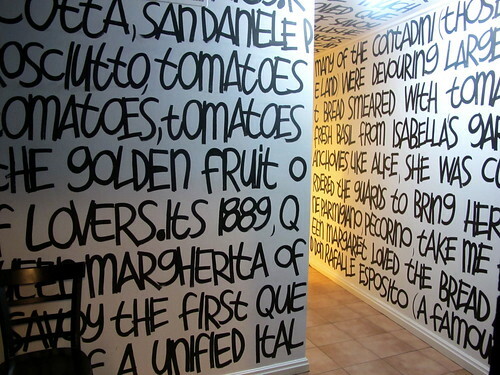 The walls leading to the toilets boldly spell out the origin story of pizza and the role in that story played by Queen Margherita of Savoy, first Queen of Italy post-unification. 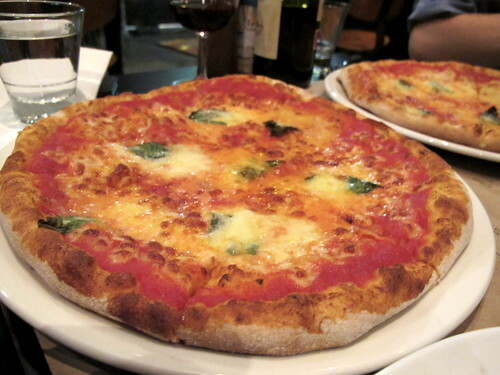 When we got there, J decreed that in order to properly review the margherita pizzas, we'd have to try all of them. As no half/half pizzas are allowed, we explained to our bemused waitress that yes, we'd like three pizzas for two people please (for the record, we shared the QM II, then had half of the QM I and the QM III, leaving us with the equivalent of one pizza to take home for leftovers). We also polished off a very decent bottle of Rioja. 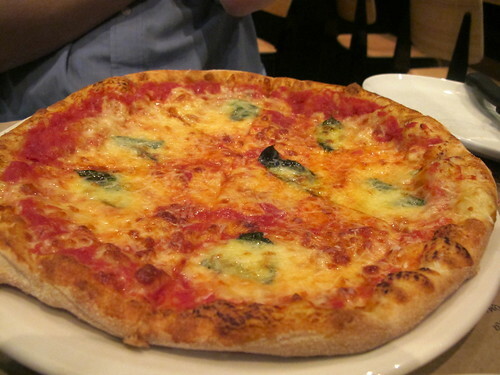 All three of the QM margherita pizzas are made with tomato and basil, of course, but the cheeses for each one differ. First of all, a word about the common ingredients: the tomato was just shy of jammy with the right touch of acidity, and the pizza base was chewy and a little bready (a bit thicker than at Ladro or Supermaxi) without being doughy. A little longer in the oven would've amped up the char factor a notch or two, but the base had a depth of flavour that I really liked (the dough is fermented for at least 24 hours). 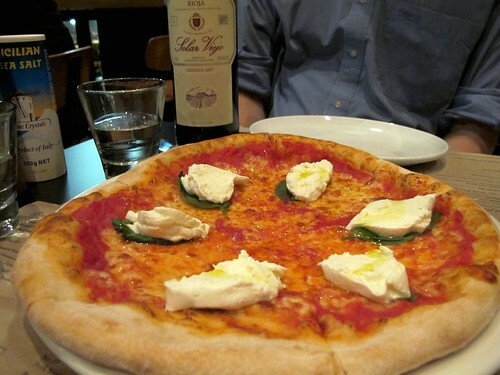 The first of the three pizzas, the QM I, was $15 and made with fior di latte. J and I agreed that the fior di latte had an unexpected bite to it that we'd more commonly associate with a blue cheese. So far, so good. The QM II was $19 and made with mozzarella di bufala. Ding ding ding ding we have a winner! In my opinion, it's ALWAYS worth paying the few extra bucks for buffalo mozzarella, cos it's so damn buttery. The QM III was $16 and made with mozzarella AND parmigiano. Probably our least favourite of the three, as I'm not convinced the nuttiness of parmesan belongs on a margherita, but it was still pretty great. The pizza menu includes more complex flavour combinations (see Joyce's review for some other options), with idiosyncratic names like 'Sock it to me', 'My only crush', 'Yeah... whatever! ', 'Sally... where are the kids?' and 'The end of the affair'. Gluten free pizzas are available for $2 extra. If pizza is not your thing, there's lasagne al forno ($18) and spinach and ricotta agnolotti ($18), plus several small plates. We're spoiled for choice when it comes to great pizzerias in this hood, but I'll definitely be back. Looks great - I love that you resisted the temptation to try some other flavours and stuck to margherita times 3! Thanks for the mention! 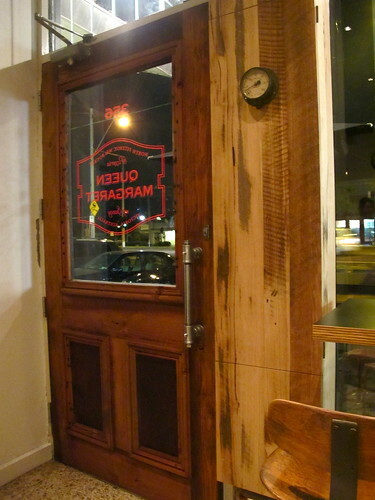 Do you think you'll return for margherita pizzas again or try something else? Seriously, Margherita pizzas have to be my least favourite because i find them so dang boring but these look amazing! 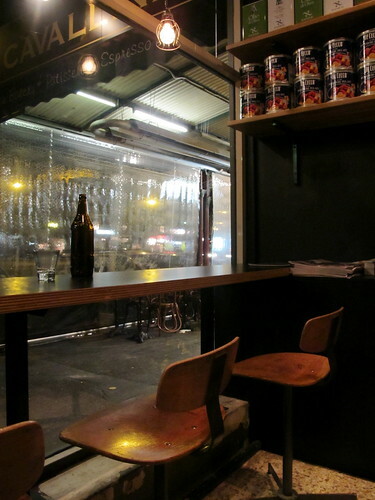 Definitely on my list of places to eat this year (or week)! Yum. If they're using mozzarella di buffala then I'm there! Long time reader first time commenter! We have been watching the newspapered windows for months waiting for this place to open. The mushrooms & pancetta was just delicious (lots of different type of mushrooms), and the pork sausage pizza was yummy too. Best and only way to judge the quality of a pizza place in my opinion. Everything else is just smoke and mirrors. Gosh that is one test I'd be more than happy to take. Let us celebrate with the adding of cheese to dough.